It’s time to have a little fun decorating a colorful Christmas tree by using skills aligned with the Common Core State Standards Initiative. Today I’ve whipped up a Christmas Tree addition activity, where students can add ornaments, bells, Christmas lights, candy canes and more to a bare fir tree. 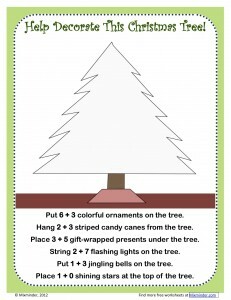 Over the next few posts I’ll be adding Christmas tree activities for more skills – namely subtraction, multiplication and division – so that other grade levels can join in on the fun. Using this worksheet is easy – simply read the instructions, and then add that many indicated Christmas items to the undecorated Christmas tree. As you continue to add ornaments and other items to the tree, it will really start to sparkle. Don’t forget to use lots of different colors and patterns to decorate the tree!